This post contains minor spoilers and scene descriptions for the new movie Raw. If you want to go in clean, turn back now. As the students in Raw prepare to dissect dogs, their professor reassures them: "Dive in -- don't be afraid." The encouragement also works for prospective viewers of Julia Ducournau's debut feature. The French flick follows Justine (Garance Marillier), a 16-year-old brainiac who leaves her sheltered, vegetarian home to start her first year of veterinary school. While there, Justine learns a lot about herself -- chiefly, that she's hungry for flesh. 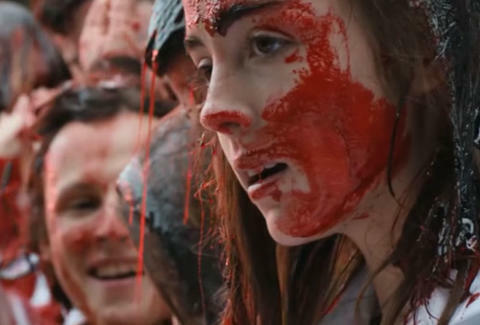 Fittingly, Raw comes packed with gory moments: The students cut into those dogs, there's a never-ending hairball puke fest, a sweet bisou becomes a bite, and there's gnawed flesh galore. Sure, a few patrons have fainted -- and some screenings now come with barf bags -- but to pass Raw off as too gross would be a mistake. You'd be missing out on a movie that very effectively uses cannibalism to put a fresh spin on the traditional coming-of-age story. We can't recommend it enough. Below, five instances that show why Raw's unique approach works so well. Before Justine's freshman year begins, the upperclassmen initiate her in ways that would give American frat pledges nightmares. To start, Justine and her comrades get Carrie'd, wearing buckets of animal blood with the same enthusiasm as the poor schmucks who used to go on Slime Time Live. Next: They swallow raw rabbit kidneys. The disgusting backdrops in both moments make the anxiety of Justine abandoning her childhood innocence that much more palpable. The social pressures at Justine's school send her on a journey of self-discovery, one that brings identity crises and growing pains of the worst variety. As a reaction to the offal, for example, she develops the kind of blistering rash that would make even Two-Face say, You should probably see a doctor about that? She does: A nurse peels latke-size flakes of flesh off her body (think fun sunburn peels, but BIG, BIG SUNBURN PEELS), asking, Is it better to stand out or blend in? It's the sickest metaphor for molting away your pre-college personality you'll ever witness. Every night, Justine's school becomes a dark-rave bacchanal, a place where she can sample profane Orties songs and explore her sexual side. At one point, her sister, Alexia (Ella Rumpf), offers to expedite the process with the kind of homemade waxing session that doesn't so much rip out hairs as it does tug at skin (awfully close up, to boot). The cringeworthy scene shows how much trouble Justine has adjusting to her new life. "I really wanted to take the female body outside of its niche and to make it universal," Ducournau told GQ in a recent interview. "You don't need to have had a bikini wax in your life to understand that this is torture." Painful would be an understatement, as evidenced by Justine's screams. Steve Carell had it easy. We won't spoil the surprise of how Justine obtains a severed human digit, but we will say it quickly winds up in her mouth, feeding a desire she never knew existed. The graphic imagery and sounds of the anti-heroine nibbling on the thing like a spare rib sent one critic at my showing storming out of the theater. I clutched my own finger as if it were in pain. It's hard but rewarding to watch, as something previously untapped -- purposely untapped -- awakens inside Justine. Her cravings begin to overrule better judgment. Her true identity starts to surface. Here especially, Marillier balances tremendous ferocity with an impressive vulnerability. Self-restraint is a necessity in Ducournau's world. If unchecked, Justine's cannibalistic vice -- surprise! -- leads to terrible consequences. She learns as much when her sister turns their friend's leg into something resembling a watermelon rind. And her dad underlines the notion when he reveals that... well, let's just say Justine's hunger has complicated roots. At film's end, she gets a Santa-isn't-real-moment on steroids, a messed-up revelation that shows her how to live her life on her own terms, capping a journey that's isn't just gross, but transformational.